Everyone who goes on adventures in the backcountry in winter remembers the old Canadian Avalanche Centre (CAC) website right? There was a lot of information, as well as a place to add reports of avalanche incidents and observations, but it was tough to navigate. Getting to an avalanche bulletin was never easy, and knowing which bulletin for the area you were going to ski in required local knowledge. Being in Rossland, the Columbia River is nearby and we are in the southern part of the Province, so I initially thought we were in the South Columbia region. Turns out we are in the Kootenay Boundary region. Looking at a map of the avalanche bulletin boundaries, this makes sense, but on the old CAC website, this was not easy to determine. Enter Avalanche Canada, renamed from CAC. Same web address, but so much more useful! Upon entering the website, the user is brought to web map presenting the different avalanche regions and a broad overview of each bulletin. The user can click on the map at the region they are interested in and bring up the avalanche bulletin for that area, if one exists. As the user can see from the large area of British Columbia and Alberta, not all areas have bulletins, but generally, around popular areas, an avalanche bulletin exists. The real power in this new website, though, is the ability for individual users to upload observations, pictures, and incident reports to the website and have them display on the map at their respective geographical locations. Heading to Kootenay Pass tomorrow? check out the recent snowpack observations from fellow backcountry enthusiasts on the map. The other intriguing feature, along with updated information on recommended and required gear, as well as information on avalanche courses and more avalanche forecasters’ blogs, is the ability for the user to see Avalanche Terrain Exposure Scale (ATES) ratings for specific slopes. This is a scale that rates slopes based on their complexity and frequency of producing avalanches. The ATES rating is used, along with current snowpack conditions to help decide whether to descend a particular slope or not. Users can now see the ATES ratings for specific slopes in a region they are interested in. This is a breath of fresh air to avalanche safety as the trend for more people heading to the backcountry for awesome turns and adventure means more eyes are on the snowpack. A one stop place to share information will lead to overall safety of people in the backcountry. People always say, knowledge is power. Ever since visiting Barkerville, British Columbia, as a kid, I have been enchanted by ghost towns. Visually, the decay of once prominent buildings is stunning but it is the feeling behind the decay that makes me excited to visit former glorious towns and cities. The sounds, smells, and activity of day to day life is what I try to conjure up in my imagination upon visiting these sites. Living in British Columbia for most of my life has allowed me to explore this feeling and have some incredible experiences. I have created a map showing the locations of the ghost towns I have visited over the years. The Kootenays have several ghost towns with Sandon being my favorite, but further north in British Columbia and the Yukon really captured my imagination with Quesnel Forks and Dawson City to name a couple of once prominent towns. Towns, cities, and civilization don’t last forever. Ghost towns serve as a reminder that our comfortable life we have now will not always last and that we can enjoy every moment while we have it. I have wasted a lot of time looking at maps and especially historical maps. Recently, I stumbled upon a website that is a collaboration between USGS (United States Geological Survey) and ESRI, who have combined to provide 178,000 maps available on a new web map site that will keep me captivated for days to come. 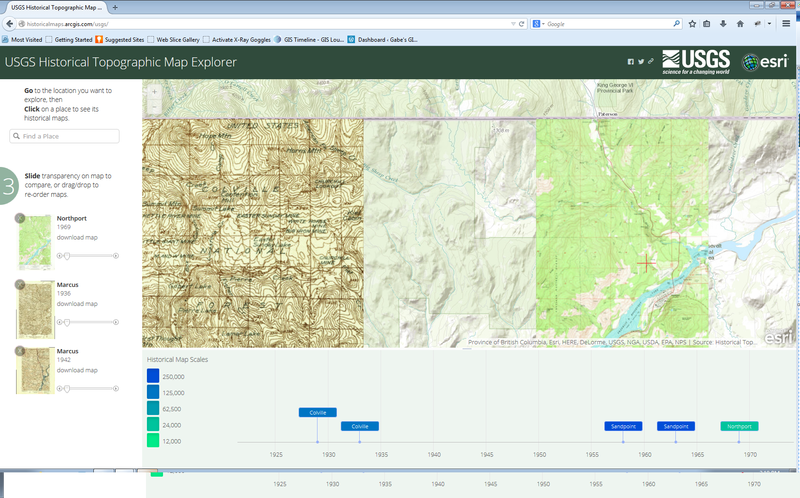 The USGS Historical Topographic Map Explorer allows users to select areas in the United States and select any number of historical maps that are available and cover the area selected with historical maps. In the example below, I selected Northport, Washington, as I love the mining history of the area. I was able to select a topographical map from 1929 showing all of the mines, buildings, and railroads in the area circa 1929.